AS A fast bowler, Imran Khan made rival batsmen quake and led Pakistan to victory in the Cricket World Cup in 1992. As a politician, he is thundering towards the election on July 25th and appears to be on the point of scoring another famous victory. 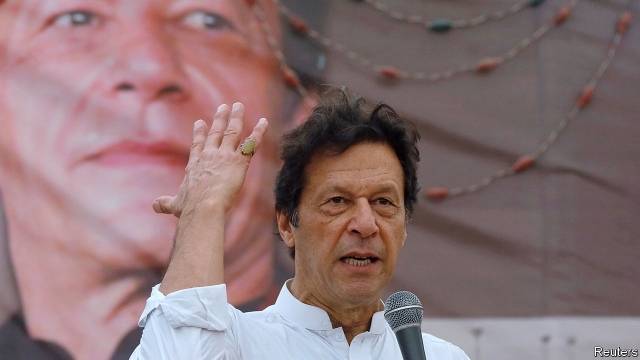 Polls suggest his party, Pakistan Tehreek-e-Insaf (PTI), may emerge as the largest; and Mr Khan may well become the country’s next prime minister. Yet, as a pukka sportsman, can Mr Khan really be happy? Although he and Pakistan’s army deny foul play, the match has been rigged. The army is ensuring that the PTI enjoys privileged access to media, endorsements from powerful people and defections from rival parties. Nawaz Sharif, a three-term former prime minister, and his daughter, Maryam, were arrested as they stepped off a plane from London on July 13th. A campaign of harassment and arrest has affected other parties’ workers far more than the PTI’s. More murkily, the others have also suffered assassination attempts and terrorist attacks, among them a suicide-bomb that killed 149 people at a rally for a local party in Mastung, in Balochistan, on July 13th. The generals have long pulled the strings of Pakistani politics. But rarely, short of taking power themselves, have they meddled so brazenly. Pakistan’s miserable failure to develop a stable democracy compares ever more starkly with the rude progress of its arch-rival, India. Whether in the 1970s in the era of Zulfikar Ali Bhutto, or in the 1990s during Mr Sharif’s earlier terms, the army’s “jeep-wallahs” first endorsed and promoted pliant civilian leaders, then squeezed them when they grew too independent, and in the end got rid of them. Mr Sharif lent his name to his party, the Pakistan Muslim League-Nawaz (PML-N), which held a majority in the outgoing assembly. He was forced from office last year after judges upheld a petty charge of failure to disclose a company directorship, then banned him from politics for life in April; he was later given ten years in prison on more serious charges of hiding assets abroad. By returning to Pakistan to face jail, Mr Sharif has turned himself from a grubby politician into something of a martyr. Nobody quite knows why the army turned against him. Most probably it thought him uppity—making overtures to India, for instance or for his quiet questioning of the deep state’s attachment to unsavoury Islamists. Mr Khan, for his part, started off posing as an anti-establishment politician, railing against the corrupt duopoly of PML-N and its rival, the Pakistan Peoples Party, founded by Bhutto and later led by his daughter, Benazir, who was assassinated in 2007. Mr Khan shows little interest in foreign affairs beyond ranting against America. He chirrups hardline views on such issues as punishing blasphemy with death. Perhaps, some think, he will even form a coalition with ultra-extremists. However, one thing that sets this election apart from previous ones is the greater outcry over the army’s match-fixing. Prominent journalists and some of the country’s largest media groups say they have been threatened and coerced into promoting the PTI and muting coverage of its rivals. At a press conference on July 16th Pakistan’s Human Rights Commission, an NGO, declared that there were ample grounds to question the legitimacy of the elections, warning of “blatant, aggressive and unabashed attempts to manipulate the outcome”. Pakistani voters may yet rebuke the generals. But outsiders can do little to restrain the army, now that Pakistan is moving further into China’s orbit. Mr Khan, who is profiting from army support today, should be aware that he will pay for it tomorrow when the generals come calling. As for the jeep-wallahs, they must see that they are harming the country they claim to defend. In the 70 years since partition, Pakistan has been torn by war, terrorism, coups, instability and religious extremism. It has lagged ever further behind India economically and on other fronts—including cricket.